I’ve been busy making lots of wreaths and garlands for my family and friends so I thought I would put up a little wreath 101 post. 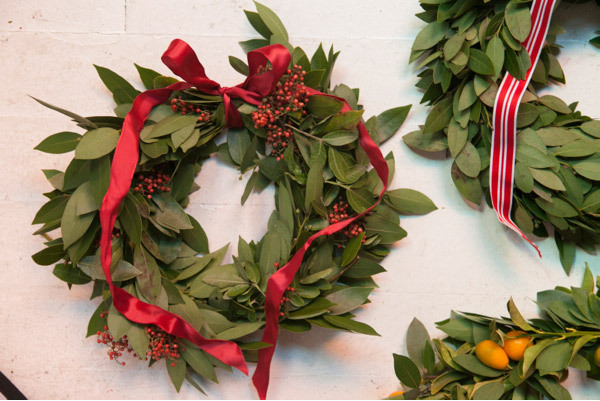 Here are three types of easy wreaths you can make at home. I am not a trained florist but simple wreaths are something anyone can do. The materials I bought from the flower market in San Francisco but if you don’t live near a flower market (or don’t grow your own) you can order greens like this through the internet or through a local florist. 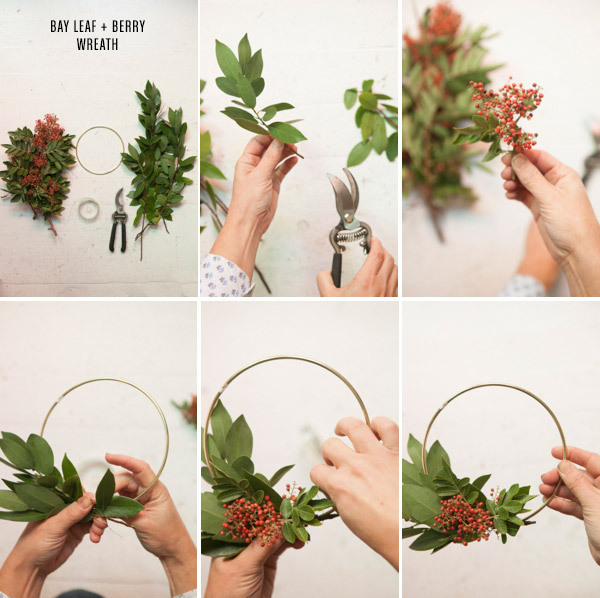 There are so many types of wreaths to make but these are some basic skills and supplies you need to make any type you want. Click through for the full steps. Step 1: Take each olive branch and cut it up into small workable sections. Step 2: Gather 3-4 sections of olive branch and hold together at the base. Step 3: Hold end of sections up to the wreath form and wrap the base 2-3 times until secure. Step 4: Repeat Steps 2 and 3 but when attaching the branch sections cover up the exposed wire of the previous sections. Step 5: Continue until the wreath form is covered. For the last step push aside the branches while wiring on the last section, then pull the branches back into place to cover the wire. Step 6: After the form is covered tuck and pull the sections on the wreath to make them how you want. Tuck in or clip an unruly branch as desired. Step 7: Attach a Ribbon. Step 1: Take each Bay Leaf branch and cut it up into small workable sections. Repeat with the Kumquat branches. Step 2: Gather 2 sections of Bay Leaf and 1 section of Kumquat Branch and hold together at the base. For this wreath you just attach asome greens to a brass ring but you leave most of the ring exposed. I like using brass macrame rings for this since they are prettier than just a regular wreath form. Step 1: Take each Bay Leaf branch and cut it up into small workable sections. Repeat with the berry branches. Step 2: Gather 3 sections of Bay Leaf, hold together at the base. Step 3: Hold end of sections up to the brass ring and wrap the base 2-3 times until secure. Step 4: Place the berry section to cover the wire and wire it on carefully so the wire doesn’t show. You’re done! 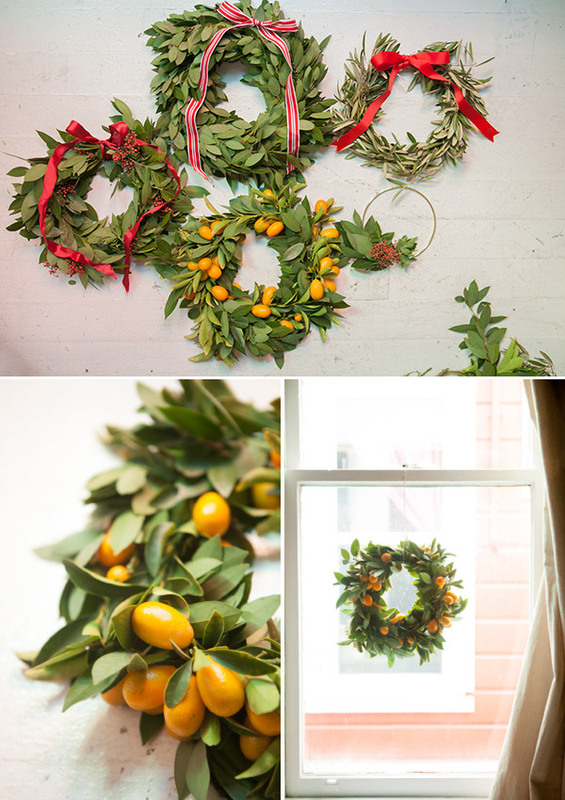 These are beautiful, I’ve never made a wreath but am definitely wanting to try it out now! Have a great Christmas! and happy holidays to you guys! beautiful! your studio must have smelled divine! I love these! You make the process look so easy and peaceful. 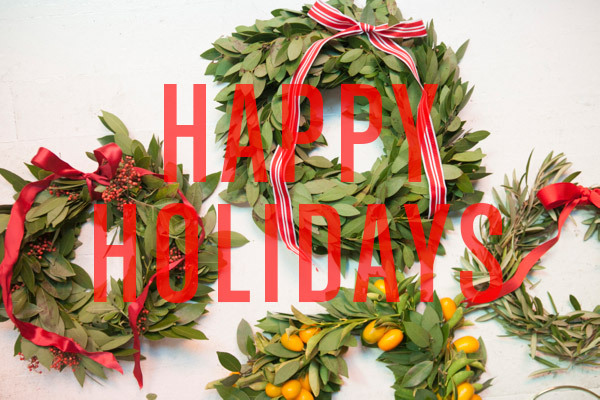 There’s still time to add holiday cheer around your home!! You could even change up the ribbon to keep them up after the holidays. Merry Christmas!! Beautiful! I need to find a wreath form, my homemade wreath is looking decidedly misshapen. Love the kumquats, also want to hang a few studded with cloves from the tree. Do you know how long these will last/when they will start to look droopy? I SO need to make a wreath next year. I’ve always wanted to – this is very helpful! 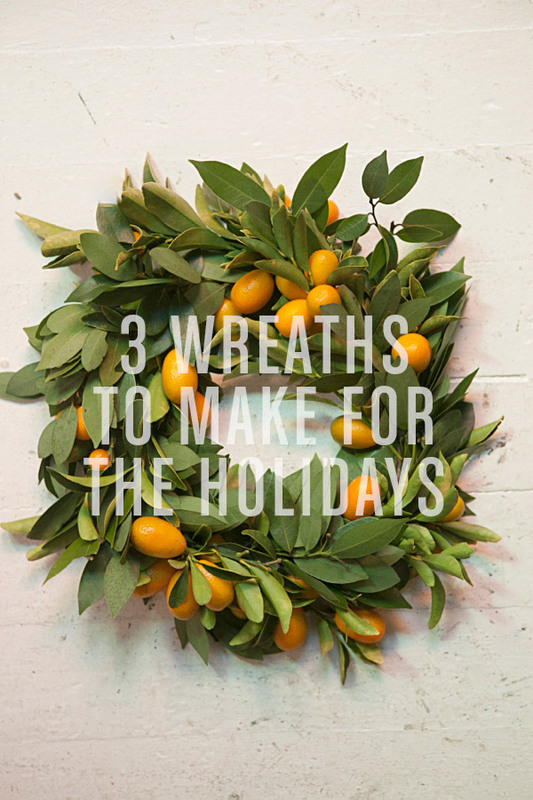 a fresh, wreath – maybe with the scent of citrus, too! they’re all gorgeous – LOVING the kumquat and bay leaf one! I was originally looking to buy a grapevine wreath, but I’m curious about the wreath form you’re using. I don’t expect it will be on sale here either, but is there any way of making one or buying something from a hardware store which would work? Desperate to make a wreath for Christmas, but they’re just not a big deal down here (and certainly not a “real” one – plenty of overpriced ugly fake ones). Thank you in advance for any suggestions and Merry Christmas! 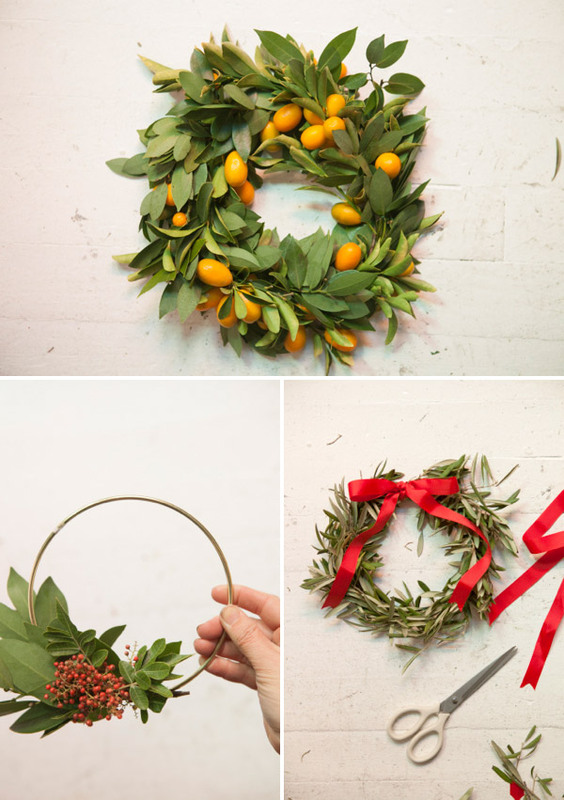 I’m in LOVE with the Kumquat branch wreath. Gorgeous! Such a gorgeous project! What a fun and beautiful gift to give. I love how simple these look, but they are stunning! A wonderful tutorial ~ happy holidays! !